SE Racing's history started over 35 years ago in 1970. Thatï¿½s when teenage entrepreneur, Scot Breithaupt began promoting "Pedal-Cross" races in Long Beach, CA. This was considered the birth of organized BMX racing. Over the years the ownership changed a few times, ending up with Mike Devitt, who also made dirtmaster products. quick guide to P.K. Ripper ID..
1999 was the last year that the US, Mike Devitt owned SE made bikes. Todd Lyons : SE started making bikes overseas in the 80's. Over 20 years before ASI (NOT FUJI) bought the brand from a factory in Taiwan. SE sales were so bad in the late 90's that the Taiwanese factory where most of the bikes were being made (Sunrise) took over ownership of the brand. Then a few years later, ASI resurrected the brand, hired me, and we've been "Making it Happen" ever since. In August of 2002, SE Racing was bought by Advanced Sports International, or ASI. The name was changed at that time to SE BIKES. They also own several bicycle related companies, such as Fuji, Breezer and Kestrel. They have been reissuing some really neat bikes including many "retro" versions, thanks to Todd Lyon's influence and position at the company as Brand Manager. SE racing or "Scot Enterprises"
So many great bikes, Quadangle, PK Ripper, OM Flyer and Floval Flyer are but a few. 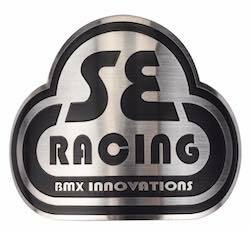 SE will always be Scot Enterprises, the man practically started BMX by himself!